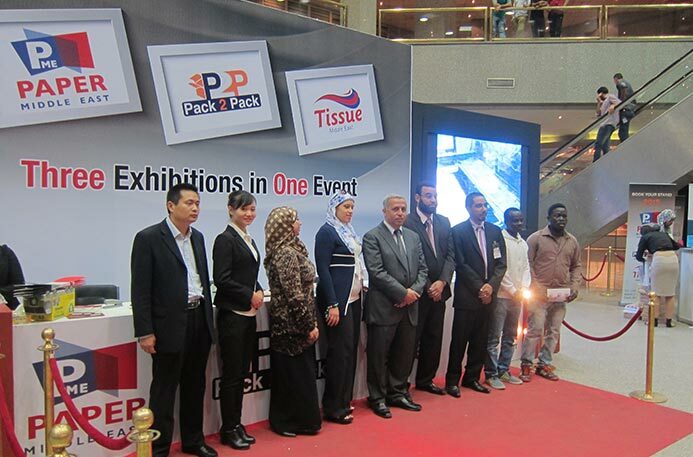 PAPER-ME 2014 Exhibition, the 6th International Fair, took place on October 22-24, 2014 at Cairo International Center in Egypt featuring latest technologies and solutions of paper, board, tissue, and packaging industry. PAPER-ME 2014 Exhibition provided a perfect platform to display the latest equipment, machinery, products and services of pulp and paper making industry. 113 Exhibitors participated in the exhibition and exhibited their products. Leizhan’s state-of-art technologies and services on paper and pulp manufacturing project were showed at the exhibition. Leizhan paper production line contains two parts: pulp making system and paper manufacturing system. Paper mill can use Leizhan new type paper machinery to produce high quality paper ( kraft paper, corrugated paper, cultural paper, tissue/toilet paper, coating board paper, etc.) by using virgin pulp, white shavings, waste paper LOCC AOCC OCC as raw materials. machines required in the pulp making system contains: chain conveyor, pulper (drum pulper, D type hydrapulper), cleaner( high density cleaner, low density cleaner, etc. ), screener ( mid consistency screen, vibrating screen, inflow pressure screen, etc. ), separator ( single effect fiber separator, single fiber separator, reject separator, etc. ), refiner( double disc refiner, claflin refiner, conical refiner, etc.). Leizhan paper manufacturing project can be divided into several sections: forming section, press section, dryer section, sizing section, reel section. Leizhan supply paper machine hi-tech spare parts like reeling machine, sizing machine, calender, dryer cylinder, press roll, felt leading roll, stretcher, gear, felt, etc. for paper plant.